Have you considered a dog daycare program? Are you worried about how your dog is spending the day while you’re at work? Hopefully he’s not chewing on your favorite piece of furniture or sleeping all day. Dogs are naturally social and energetic so being sedentary can lead to boredom, bad behavior and possible health problems associated with obesity. Studies have shown that dogs that receive high levels of exercise and mental stimulation are less likely to engage in destructive or bad behaviors due to boredom. Energy that is directed toward positive, healthy experiences and playtime leads to better behavior in public and at home. Choosing a quality dog daycare program is a great option to keep your dog active and engaged. For a little more than the cost of a dog walker, your dog can have a full day of play with other dogs rather than a couple quick walks around the block. Here’s what you should you look for in a dog daycare program. The program should target the social, emotional and physical wellness of your dog. 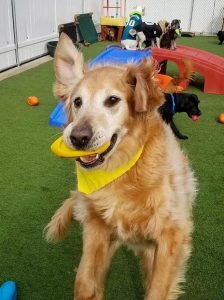 For many years, the daycare program at Holiday House Pet Resort & Training Center has offered a structured program with a balance of active play and necessary rest with enrichment games, themed weeks with fun activities, and special events. 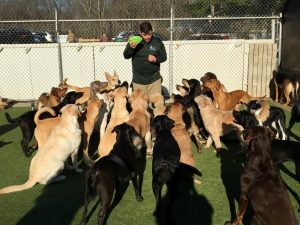 As our dog daycare program has grown in popularity, a new play yard was opened and fresh activities and games were added to broaden the focus on a variety of behaviors and skill reinforcement. The purpose of these added activities is to engage your dog mental and physically. They can be customized to work with an individual dog or used with a larger group to reinforce manners and obedience skills. The Name Game: Not only does this game help our younger students recognize their name, it reinforces social etiquette and attentiveness. Group Sit: In a world full of distractions, a little focus can go a long way in helping a dog recognize the difference between good and unwanted behaviors. This activity is designed to reinforce attentiveness, manners and obedience skills. The Silent Game: No, this game isn’t about who can go the longest without barking—but that would be interesting! There’s more to communication than using words. The focus of this game is decoding both the daycare teacher’s and dog’s body language and improving means of communication without words. Fetch-It Fridays: This is like when your mom sneaks healthy veggies into your spaghetti sauce or smoothie without you ever knowing it. Sure, it’s a fun activity on the outside, but is chock full of learning on the inside—mental and physical stimulation, attentiveness and social etiquette! Follow us on Facebook to see Group Sit and Fetch-It Fridays photos! When choosing a quality dog daycare program, look for one that offers more than just a space for your dog to run around. Dogs are smart and the activities offered in a dog daycare program should provide enrichment and learning in a fun and loving environment. The dogs in the daycare program at Holiday House Pet Resort & Training Center are supervised by highly-trained staff with experience in canine behaviors, training methods, and overall pet care. From young dogs to older dogs and young dogs to old dogs, a well-rounded daycare program can blend different breeds and sizes. Our program provides controlled and positive social interaction with dogs that have a variety of personalities and play style. Spend less time wondering what your dog is doing during the day and more time feeling great about the positive interactions and fun you are giving your best friend. You’ll both benefit from the experience, and return home after a long day happy and ready to snuggle. For more information about the dog daycare program at Holiday House Pet Resort & Training Center or to schedule an evaluation, call 215-345-6960.